You'll be £4.99 closer to your next £10.00 credit when you purchase Tracing Your Railway Ancestors. What's this? A sequence of short, fact-filled chapters gives an all-round view of the development of the railways. In addition to tracing the birth and growth of the original railway companies, she portrays the types of work that railwaymen did and pays particular attention to the railway world in which they spent their working lives. The tasks they undertook, the special skills they had to learn, the conditions they worked in, the organization and hierarchy of the railway companies, and the make-up of railway unions - all these elements in the history of the railways are covered. She also introduces the reader to the variety of records that are available for genealogical research - staff records and registers, publications, census returns, biographies and autobiographies, and the rest of the extensive literature devoted to the railway industry. This excellent book will really get your family history back on track as opposed to chugging along. A superbly comprehensive social history of the British Railway industry which should appeal to anyone with even a passing interest in the topic. 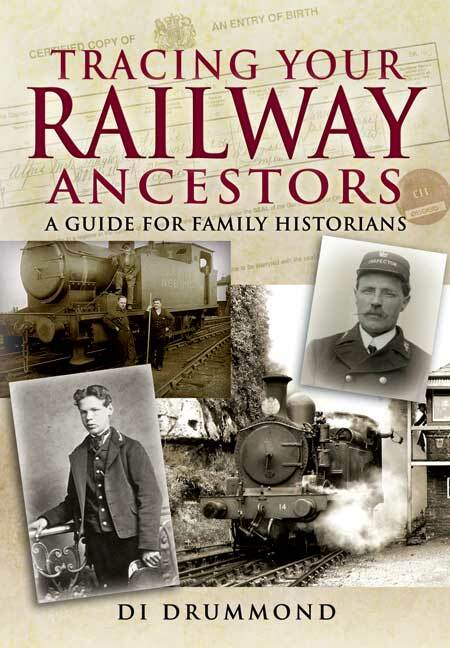 A comprehensive and practical reference guide to sources for discovering the lives of railway ancestors. This book puts the problem in perspective, provides excellent guidance on how to do research, and illustrates well what can be found on the companies and their workers. The author is one of the country's leading experts of the history of the british railways, and in this detailed work she not only provides a concise overview on the history of the railways, but also paints a picture of the world within which its workers lived. The first half of the book covers two areas, starting with the history of the rail network across Britain, from the creation of the railways to the nationalisation and beyond, before moving on to examining life working in the industry, with notable chapters on the role of women in the workforce, the navvies who built the lines, and life on the stations. The rest of the book concentrates on sources to help with your research, including detailed commentary on the use of sources at the National Archives, the British Parliamentary Papers, trade union records and more. Di Drummond's concise and informative guide to Britain's railways will be absorbing reading for anyone who wants to learn about the history of the industry and for family history researchers who want to find out about the careers of their railways ancestors. In a clear and accessible way she guides readers through the social, technical and economic aspects of the story. She covers the themes and issues that family historians, local historians and railway enthusiasts will need to understand in order to pursue their research. Dr Di Drummond is senior lecturer in history at Trinity and All Saints' College in Leeds, and she is a leading expert on Britain's railway history. She has carried out extensive research on the Victorian railway industry and the railway companies, on railwaymen, navvies and overseas railway workers and on women and the railway. In addition to her book Crewe: Railway Town, Company and People, 1840-1914, she has published many articles on railway history in journals and magazines.